Recently, I've been eating at a lot of new places/events in the Kaka'ako area. This time, before my friend, Chad, left for Grad School, he took me to Hank's. Chad told me about it while having a late lunch at Tango, and ever since, I wanted to try these hyped-up homemade dogs. My feelings on Hanks's? Very tasty dogs. You can tell they are definitely homemade. By the flavor and price. Yeah, they are on the smaller side (definitely not Costco-size hotdoggies), and cost from $7-10.50. $10.50 gets you the Friday Special, the Lobster Dog. Chad explained it to me as tasting like a crab cake in a hot dog form. Interesting. 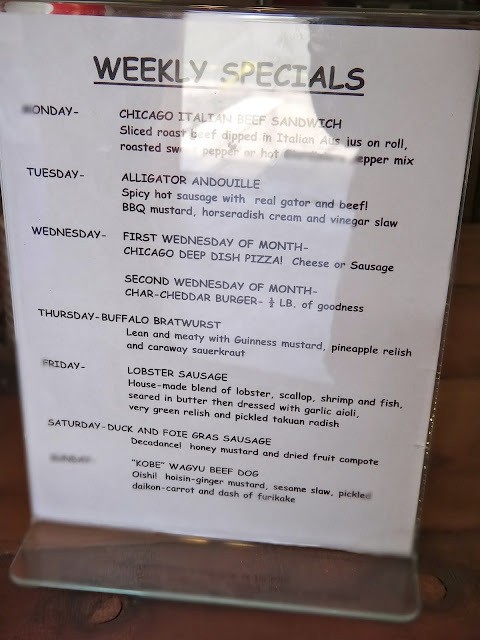 The day we went though was a Thursday, and Buffalo Bratwurst was the Special of the Day. You know that's what I ordered! They are known for their Chicago Dogs, and that's exactly what Chad ordered with a side of fries and spicy ketchup. These were the double-fried fries, though next time, I'm up to try the duck fat fries! YUM. They also have specialty drinks which all sounded so refreshing and delicious on a hot day...or any day. I wanted to try all of them, but opted for the Pineapple Ice. I would highly recommend! Also, FYI, Mondays can get a busy. It's 2 for 1 day. A great deal, but expect to wait! One more thing- we went on Thurs around 130pm, and parking was great and no line inside the place! I easily found 1 hour street parking RIGHT IN FRONT! PPS- Duck Fat Fries are only served on Saturday and Sundays, but you can get their "Awesome French Fries" any time, any day! Located on Coral Street, oceanside. Guess who featured Hank on his show, Diners Drive Inns and Dives? My Buffalo Bratwurst with Pineapple relish, Guiness mustard and Sauerkraut. Pineapple Ice in the background! I love these. They are the most comfy sandals EVER!